If you are aiming to build your fashion website for your garment store then Clothing WordPress themes is here to help you out with all necessary functionalities. Nowadays, fashion is one of the most developed industry in this online world. It is the superlative mode of expressing yourself and your culture. The online business maintains your visibility in the market. Online marketing is one of the best and easiest ways to sell your products anywhere anytime. Create your online clothing store with these powerful layouts and start growing your clothing center & garment business online with these 10+ selected themes. These themes offer great features and functionalities that anyone can create an outstanding blog design. Onlineshop is a multipurpose portfolio WordPress theme that offers you the platform for promoting your clothing business. 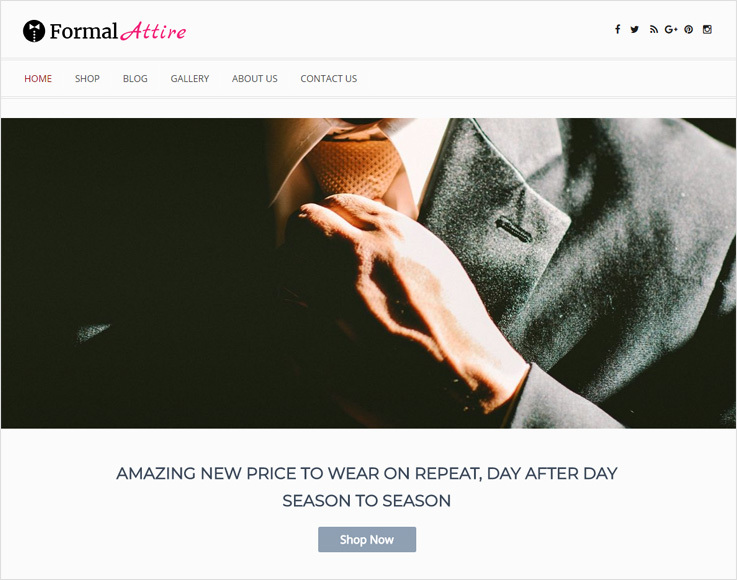 The theme is crafted for a high-end online clothing store. You can sell your trendy outfits, dresses, and other related stuff by using the functionalities of this e-commerce WordPress theme. The theme comes with favicon uploader, you can add your own company logos through custom logo section. Make your website multilingual with WPML. 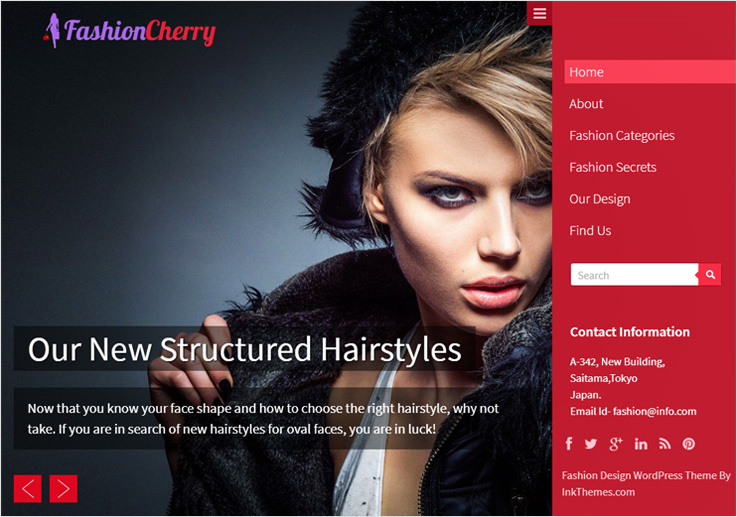 Fashioncherry is a multi-purpose e-Commerce template is for clothes designer, fashion designer, glamor originator and so on. With this responsive WordPress theme give your fashion website a new height of success. You can use this theme for fashion institute, academy, and universities as well. By giving the bookmark effect you can add more beauty to your website. Through its multilingual option, anyone can easily find the stuff with the help of their own regional language. The theme is compatible with the latest version of WordPress 4.5+. Make your website compatible on any screen with Twitter Bootstrap. 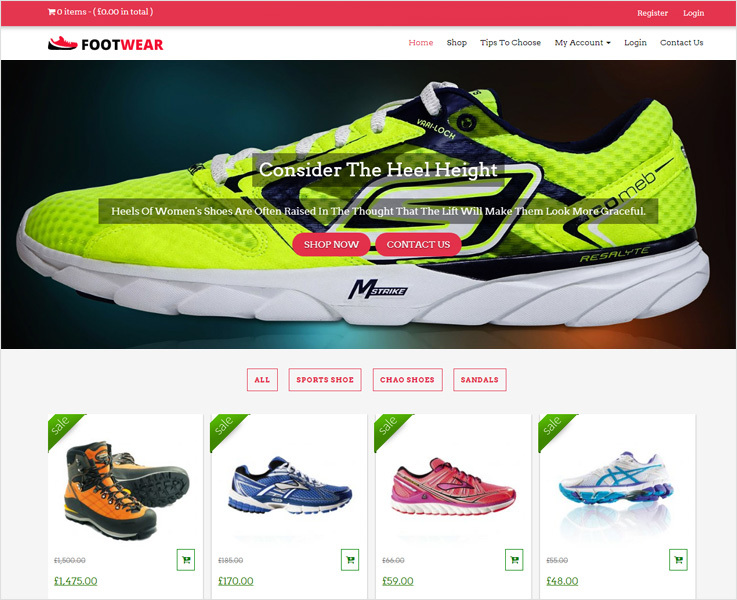 Footwear is the grid-based online e-commerce WordPress theme. This theme is all about selling goods and services. This theme will play a vital role to grow your shoe or fashion business on the web. Furthermore, it is a fully responsive design so that your e-commerce website for a shoe shop, fashion store, boot showroom etc., looks stunning on every screen. The theme comes with a shopping cart, Google map integration, easy setup with clean code. Make your website multilingual with WPML. AngelWear is the beautiful WordPress theme designed for kids zone, baby product, kids planet, infant clothing and others. With AngelWear theme give your customer better satisfaction with latest offers and deal on all range of product. The theme is completely integrated with wooCommerce. This theme is well organized and clean, cross-browser support. Showcase all your items and short theme according to their types with product category section. 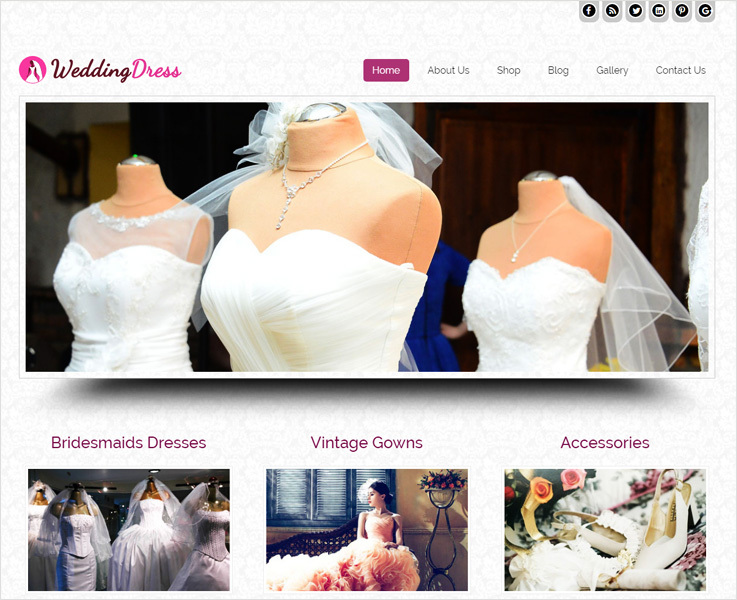 WeddingDress is a premium WordPress theme with a trendy and tender look. The theme crafted for bridal shops, designers, marriage apparel providers and so on. The theme consists of all the necessary features for your website that is actually that you need to sell wedding dresses online. Share your videos on homepage widgets. The theme fully responsive, cross-browser compatible, and you can add a custom logo, copyright text, and favicon in a go. When it comes to professional ethics then the person’s dress codes matters a lot. This clean, simple and business WordPress theme is mainly designed to sell formal dresses online. This minimal WordPress template is made for cloth manufacturing companies, business wear sellers, formal wear retailers and the likes. You can use this theme to sell your formal dress material globally. The theme supports WooCommerce plugin integration. 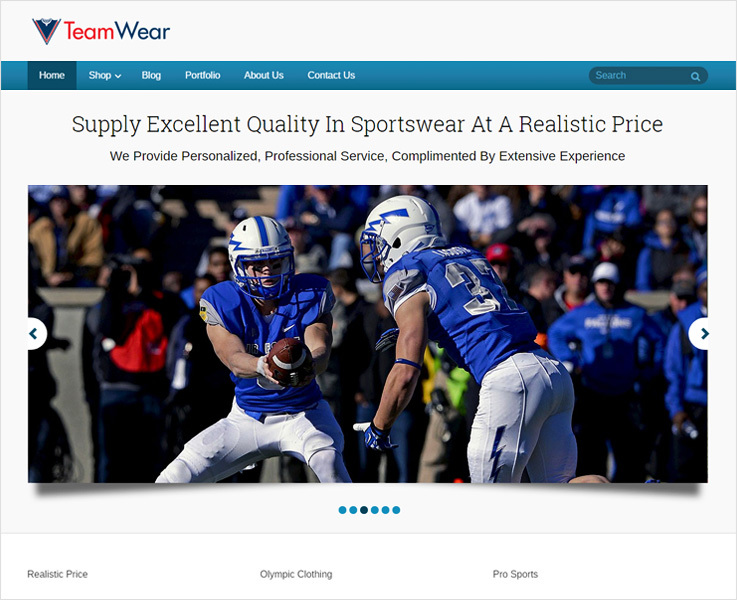 If you are really planning to launch a sports website and want to amaze your audience as much as possible, SportsWear is the completely resourceful WordPress theme. This minimal theme is useful for all sportswear shops, sports clothing manufacturers, Gym apparel stores and more. The theme supports RTL, separate mobile header option, social site integration to leverage more traffic on your website, multiple color option and advanced typography option available. 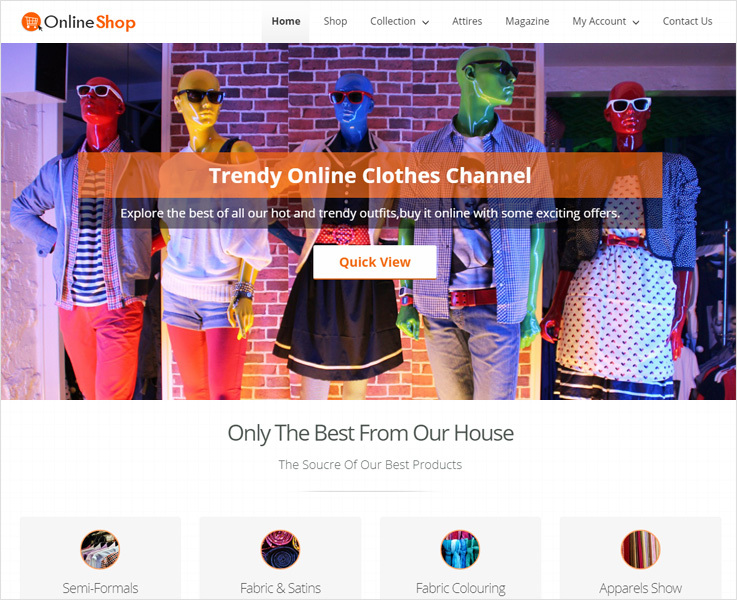 This fashion WordPress theme targets to broadcast your offline clothing store to an online platform. 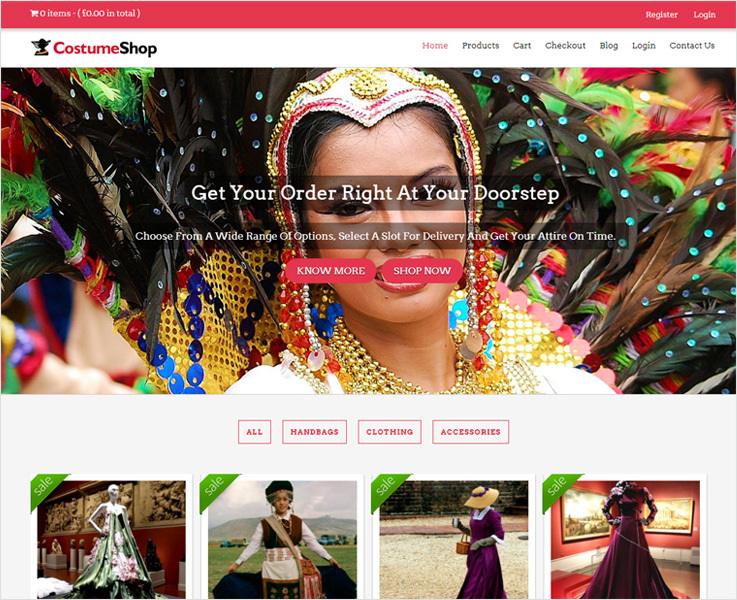 The custom shop offers a deep integration with WooCommerce which helps to create an online apparel store beautifully. Its layout centers the customer’s attention on your attire collection accessories. The theme is multipurpose and can be used for every occasion. The theme has full-screen image slider, call to action button available for user guidance, has a completely responsive layout, and many more. 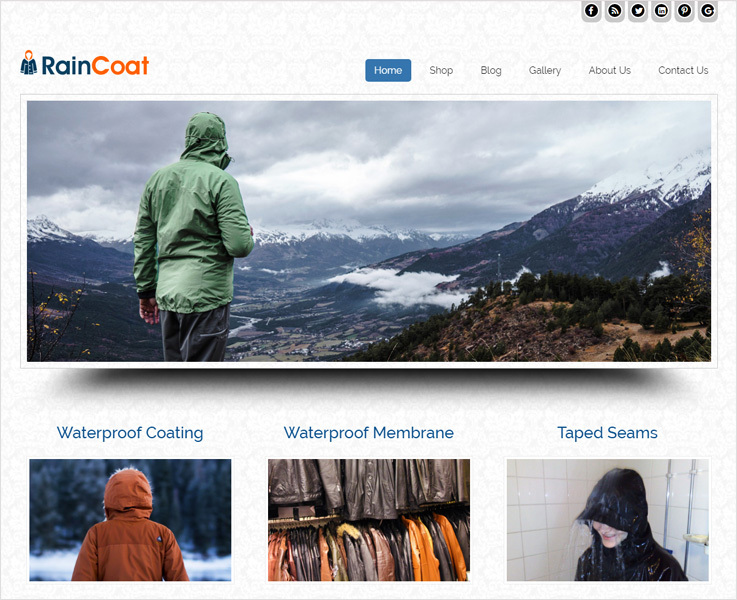 Raincoat is responsive, clean and simple clothing WordPress theme designed for waterproof dress sellers, clothing industries, cloth manufacturers and many others. The theme has completely responsive layouts, WPML compatibility, includes banner section and made with debug mode. Most of all, this theme has a beautiful design which grabs the customer attention at once. 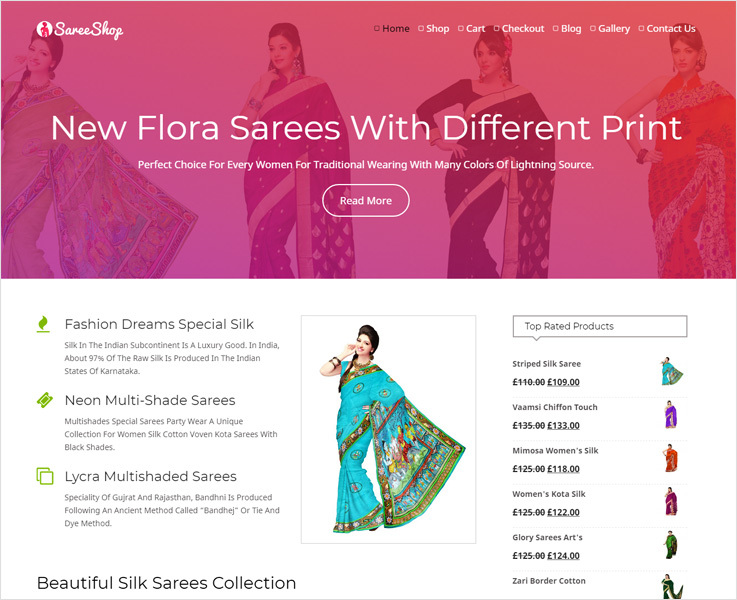 Saree shop is an impressive and modern theme for an e-commerce site. Present your huge collection of sarees by using SareeShop WordPress theme. The design of this theme is ideal for saree distributors, garments sellers, fashion traders and many more. This theme runs efficiently on all browsers and supports W3C validation service and homepage with or without sidebars. You can aware the customer from designer accessories, silk fabric, boutique collection and much more through its elegant responsive layouts with multiple e-commerce functionalities. This was our take on the 10 Best Clothing WordPress Themes. We hope that you must have got a perfect WordPress theme for your clothing store. Finally, get started with taking your business to a next-level with these themes.